What Might Be the Lessons From Chile? 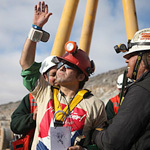 We are still groping to understand the extraordinary sense of triumph as each of those 33 Chilean miners was brought to the surface in their banged-up, little tube. There was so much that could go wrong, from the first days that the miners were discovered trapped a half a mile beneath the surface, to the singing of the national anthem as the last miner, the leader who chose to come out last, stood on top of what could have been their grave. So much could have gone wrong. We have come to expect that things will go wrong, but they didn’t. This was human triumph in a world that has experienced so much failure. Oil spills that refuse to be capped; financial collapse that trudges along with destruction in its wake; political leadership that can’t shake the paralysis of old ideological baggage and can’t therefore step up together to find solutions for our problems; the seeming collapse of moral cultures that might otherwise channel the best of human energy — collapse and paralysis and yearning for something more — these are the things that seem to define our expectations. And yet somehow the president of Chile, who took a huge political risk in all of this, and the teams of administrators and technicians from all over the world gathered around a single, intensely focused project of saving these lives — and they did it. They actually worked together. The machines actually worked as they were supposed to. And the rest of the world watched in some measure of awe. We have been told for over 200 years that the power of the state, or laws of the realm, or a thin, weak layer of what we might call civilization are the only things that keep us from the law of the jungle, where the knives come out, where social order collapses, where power is the only thing that matters. And so part of our marvel was how these miners could have formed a surviving culture together. When these kinds of things happen we are prone to think about the Lord of the Flies. This is a book that haunts the imagination of a generation or two of modern readers. Here were a bunch of privileged young guys who found themselves stranded on an island. Quickly the veneer of their social upbringing is peeled away and we discover something atavistic, primitive, something deep within human nature that pits them against each other. It is all about power, as Nietzsche told us. Chaos lies just a few steps away from what we regard as normal civilized behavior. But what happened down in that trapped apartment half a mile into the earth in Chile? Can people really discover together a vision for the common good? Can they really gather around a meaningful endeavor and get a job done? Can we really marshal the forces of political culture and technical culture and moral culture to solve an enormously complex challenge? And what did faith have to do with forming these men into a surviving unit rather than a self-destructive, splintered group? I don’t want to claim too much of this sort, because we don’t know enough, but we did witness some of the miners kneeling as they surfaced, crossing themselves, clear evidence that faith was a defining force for some of them at least. And what did we learn about leadership? It is quite astounding that the man who took over and arranged for surviving underground — the rations, the exercise activities, the sleeping routine, the play — this strong man chose to be the last man out of the hole. What are the lessons in that powerful statement, both the strong, take-charge side, and the servant, sacrificial side? I have a sense that at least some of these guys will be able to articulate answers to these questions in the days to come. I hope so. Something happened here. Something about human triumph and courage and community and leadership and the desire to do something extraordinarily good together. This event got the entire world’s attention and has become an inspiration to myself and many. I was touched when the last one gets to the surface. It’s like the world eagerly waits to see when the misery of the family be ended. The lesson that will be learned from this must not be left in the abstract but must be followed in day to day effort to ensure that safety standards must be religiously followed so we will not count days of psychological torture again. All this shows me how much we all, men and women want to make a difference. I am impressed with the intelligence and expertise that was displayed by an incredible number of people to create the opening to rescue the trapped miners. These same qualities were at play in capping the oil leak, although the media did not report in a similar fashion the extraordinary hours and hard work committed human beings engaged in to solve this challenge as well. It gives me faith in human ingenuity and what hard work and smart people can accomplish. I read one report that described how the miners were divided into two groups: miners employed by the company and contractors. I understand part of this was pschological, to keep everyone on their toes, so to speak. But I also wonder if there is was a class distinction as well. As President Eaton commented, hopefully with time we will learn more about the strategies the miners took to “keep their heads about them”. What we must keep in mind is that both disasters were the result of the companies cutting corners, saving costs, and not following accepted safety standards. We again put human beings at risk for the sake of productivity and profits – a lesson to be remembered yet again!